Look to FishDuck.com to bring you coverage of the 2015 Men’s and Women’s NCAA Track & Field Championships. Covering the event for FishDuck will be our editor-in-chief and former Oregon Track Club member Mike Merrell, who narrowly missed qualifying for the 1976 U.S. Olympic Trials in the marathon. In addition to following all of our Oregon Ducks, Mike will be live at Historic Hayward Field to also bring you coverage of the team races. Both men’s and women’s team races are largely a battle of Oregon vs the SEC. On the men’s side, the Ducks will do their best to overcome Florida, LSU and Texas A & M. On the women’s side, fellow Pac-12 member USC and Big-12 power Texas join the Ducks in a seven-way battle against the SEC’s Arkansas, Texas A & M, Florida and Georgia. The Ducks hope for big first day points from Sam Crouser. 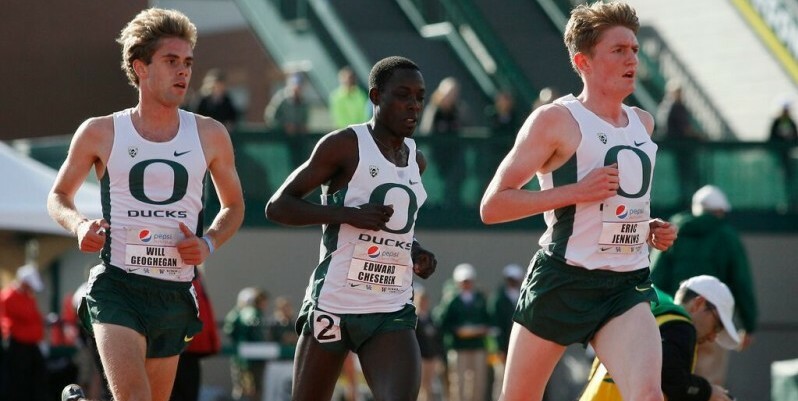 The Ducks men should — and need to — jump to an early lead on Wednesday with big points from Edward Cheserek and Eric Jenkins in the 10K and Sam Crouser in the javelin. 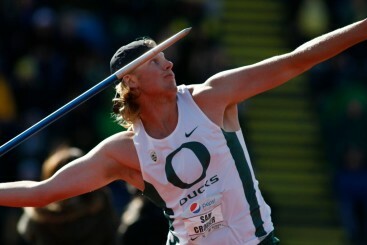 The only men’s event finalized on Thursday is the two-day decathlon, where Oregon hopes for additional points from Dakotah Keys. Most of the men’s finals are on Friday, and look for Florida, LSU and Texas A & M to eat away the Ducks’ lead — and probably overtake the Ducks with only two events left — the 5K and the 4 X 400 relay. The Ducks have a 4 X 400 relay entered, but are not necessarily expected to make the final. This could very well put the team race back on the shoulders of Cheserek and Jenkins to score big points in the 5K, both doubling back from Wednesday’s 10K. On the women’s side, Arkansas and Georgia are expected to jump out to an early lead on Thursday, with Arkansas scoring big in the pole vault and 10K and Georgia in the heptathlon and long jump. The long jump will be a critical first-day event for the Ducks. Jenna Prandini and Jasmine Todd should both score, but where they score will be critical to the meet’s outcome. The over/under is a second-place finish for Prandini and a sixth-place finish for Todd. 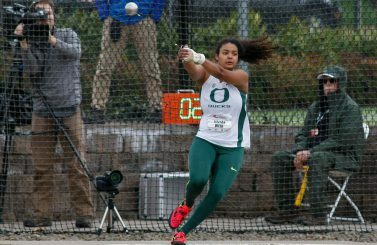 The Ducks are also looking for Thursday points from Jillian Weir in the hammer and Brittany Mann in the shot put. We don’t expect much noise out of USC, Florida, Texas or Texas A & M on Thursday, but we will be watching to see how many athletes they advance out of the preliminary rounds. The four schools are concentrated heavily in the sprints, hurdles and relays. Jillian Weir looks to place in the hammer. For Oregon, the most critical things to watch on Thursday will be the 100 meters, 200 meters and both relays. The Ducks really need to get at least one relay to the finals to expect to win the meet, and getting both the 4 X 100 and 4 X 400 to the finals would be a bonus. The Ducks also need strong semi-finals from Prandini in both the 100 and 200 and from Todd in the 100. Raevyn Rogers in the 800 leads a contingent of Duck middle-distance runners who hope to advance to the Saturday finals. Going into the meet on Saturday, the women expect a dogfight. Georgia will likely be the first team to fall by the wayside, with likely points coming only in the high jump and triple jump. As for the remaining six teams, there is a lot of head-to-head competition shaping up in the sprints, hurdles, relays and to a lesser extent, the middle distances. 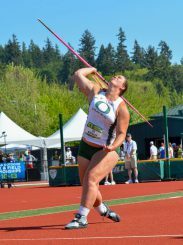 Points from Liz Brenner in the javelin would be a bonus for the Ducks. The outcome of the women’s championship is likely to come down to the final event, the 4 X 400 relay, and it could be that the meet will be won by this team or that team finishing as high as third, or possibly even just making it to the finals at all. Advancing athletes through the semi-final rounds on Thursday sets up the drama for Saturday. Gaining or losing qualifiers here or there on Thursday could mean the meet. Both men’s and women’s meets are expected to be the most highly contested in recent history. Track & Field News projects four teams within six points of each other on the men’s side and six teams within four points of each other on the women’s. The events score the top eight places (10-8-6-5-4-3-2-1), so the differences among the top teams are literally a tenth of a second or two here or there. Follow us daily as we follow our Ducks!